US LNG is already changing the global trading landscape and substantially more is to come, causing as far-reaching change as shale oil did in the oil market. Increasing volumes of US LNG reaching Central and South America, Asia and Europe are leading to a shift towards more flexible trading, shorter and smaller contracts and increased spot trading. Non-long-term contracts have grown from 5% to 30% of all LNG trading during the past 15 years and are expected to keep going up as more LNG comes to the market. These changes are likely to lead to more integrated global LNG markets. BP’s Energy Outlook 2017 forecasts that LNG supplies will grow rapidly to account for over half the traded gas by 2035, led by LNG exports from the US, Australia, Qatar, Africa and Russia (Figure 1). Asia will be by far the biggest destination for LNG.Greater availability of LNG has already helped to flatten global gas prices. BP, in its Statistical Review of World Energy 2016, showed that global LNG production grew rapidly, with global supplies set to increase by a further 30% by 2020. This glut in supply led LNG prices in 2016 to drop 20% to 30% in comparison to 2015 and they are likely to remain low in the longer-term. More countries are now importing LNG, benefiting from low prices and lower costs offered by FSRUs. Spot LNG now accounts for 18% of global LNG trading, up from 15% in 2015. Adding short-term contracts increases this to about 30%. BP’s Review also pointed out that Europe’s access to plentiful supplies of pipeline gas, particularly from Russia, means that LNG imports are facing stiff competition. In terms of this battle of competing supplies, if one can call it a battle, 2016 went to pipeline gas. The increase in European gas demand was met mostly with gas from Russia and Algeria, with LNG supplies remaining flat. Russia has a strong incentive, but also the capacity, to compete to maintain its market share in the face of growing structural competition from LNG supplies, although so far, Gazprom Export boss Elena Burmistrova said at the Flame Conference in May, it has not had to lower its prices to retain market share: prices have fallen anyway thanks to low oil and to low demand. However, Europe is still looking for opportunities for diversification of gas supplies and has the option of importing LNG as and when the need arises. Conversely, as US LNG comes on stream, it can choose whether to go to Europe, the Americas or Asia depending on the price. On the other hand, some northern European countries, more determined to diversify away from Russian gas, such as Poland and Lithuania, have just started to import US LNG. US LNG exports began in February 2016 from Cheniere’s Sabine Pass facility and have since then been delivered worldwide (Figure 2). By 2019 Cheniere expects to have seven trains operational at its Sabine Pass and Corpus Christi terminals, with a total capacity of 42bn m³/yr, making the company the fifth largest LNG supplier globally. This has been facilitated by clauses allowing destination flexibility, as well as Henry-Hub linked prices, built into US LNG contracts. These exports are already putting the US on the way to become a net gas exporter by 2018. Until recently, these destinations did not include northwest and north Europe. But by June 10, the first two US LNG cargoes reached northern Europe, delivered to Poland, the Netherlands and, a month later, the UK. This marked a new historic chapter in the US LNG export sector. Previously exports were mostly to southern Europe, Spain, Portugal, Malta and even Turkey. In a recent interview the CEO of Continental Resources Harold Hamm said: “Natural Gas from the US is going to have a world impact.” And it is. As pointed out recently by the Atlantic Council, US LNG is boosting the economic and geopolitical influence of the US in international markets. In addition, the enlargement of the Panama Canal is allowing US LNG suppliers to transport LNG competitively to wider markets across the world. The first LNG transit through the canal was in July 2016. Since then over 100 LNG vessels have crossed it on the way to east Asia, with the voyage time shortened by 40%. In addition to Sabine Pass, there are another five terminals being built, with an estimated capacity of 73bn m³/yr, scheduled for completion by 2019 (Figure 2). A further four, all on the US Gulf coast, have been approved but are not yet under construction. These will make the US the third largest LNG producer in the world, with 14% of the market, behind Australia, with 22%, and Qatar, with 21%. 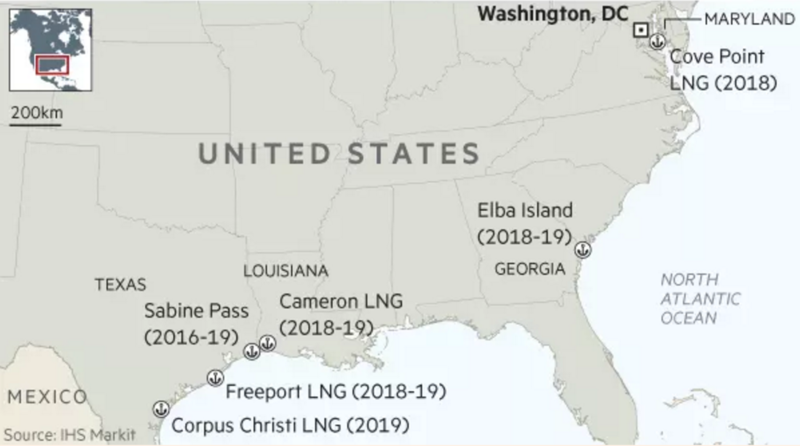 The US Energy Information Administration (EIA) forecasts that including these projects, US LNG exports could exceed 100bn m³/yr by 2025 and further after that. LNG exports are expected to drive US gas trade. These forecast exports are mostly based on projects that are already being planned, but there are more to come due to the ever-increasing US gas production. 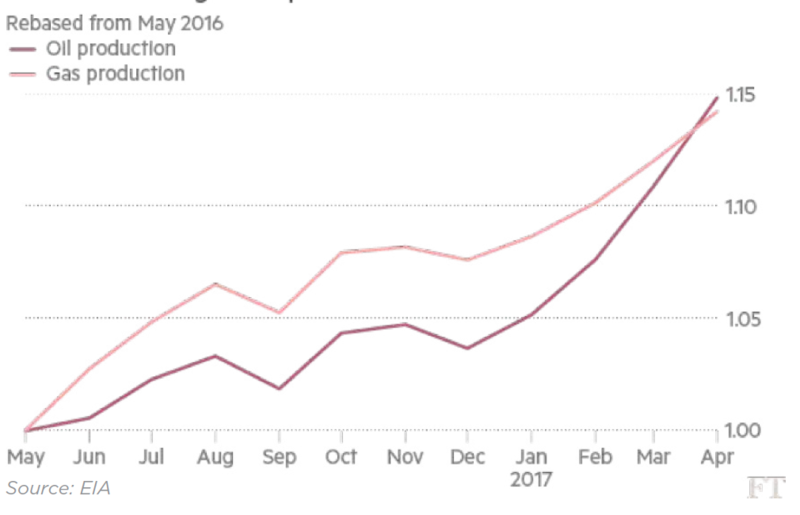 US’ huge shale potential and a deluge of new gas production, including associated gas as oil production rises (Figure 4), promise to keep the US awash in excess supply and lower price. Rising LNG exports and exports to Mexico help ease this excess gas supply. But there is more to come. In the North American gas market, domestic electricity production and industrial use are not expected to grow fast enough to absorb this gas. As a result the focus is shifting towards LNG exports and the pressure to approve and construct new LNG export facilities is increasing. The EIA forecasts that natural gas production will increase by an average of 14bn m³/yr in 2017 and by 29bn m³/yr in 2018. Given that much of the gas is associated gas, it will need to find markets if it is not to affect oil production. Without new markets, producers are concerned they will not be able to get rid of it. Duane Kokinda, president of pipeline giant Kinder Morgan, said: “Oil companies want to move gas as quickly as possible so they can produce more oil.” Given that production costs are mostly recovered from oil, associated gas prices could go down very low, making US LNG exports quite competitive. LNG exports will provide outlets for US gas and thus will help balance the domestic market and curb price volatility. They will also promote further gas production, adding further to emissions reductions. Even though there is a sentiment of a global LNG glut, low prices appear to be creating new demand as new buyers enter the market. This has helped Cheniere place cargoes relatively easily to a wide variety of customers and should help it weather a tougher market over the next few years as a deluge of new LNG enters the market. US oil and gas companies have been complaining that the complexity of the permitting process and delays are putting LNG and gas exploration and production on the sidelines. Their contention is that there is no reason why LNG can’t be exported like crude oil. There should be no need for special permitting. The Atlantic Council agrees with this. It suggested recently that fundamentals are in place for the US to become a global LNG supplier, and the federal government should accelerate the process by simplifying, shortening, and changing the existing LNG export approval process. Changing the US approval process by eliminating the distinction between LNG export sales to customers in countries that do not have a free-trade agreement (FTA) with the US, and countries that do, would increase the ability of US sellers to move LNG cargoes to destinations where these are most needed. The process started last April, when the US Department of Energy (DoE) approved that all future LNG exports from the Golden Pass project in Texas may be exported to non-FTA countries. This approval was extended to include exports from planned facilities at Texas, Louisiana, Florida, Georgia, and Maryland and Gulf of Mexico. Tellurian also plans to develop a number of LNG projects along the US Gulf Coast, including a 26mn mt/yr facility called Driftwood LNG, which will begin operating in 2022. On 29 June DoE approved applications to export more LNG from Shell’s Lake Charles project, extending the plant from 20.7bn m³/yr to 24.1bn m³/yr. In addition, a MOU was signed between Sempra Energy, Woodside and Kogas to proceed with Port Arthur LNG in Texas. The planned capacity is 14.5bn m³/yr, scheduled to become operational by 2021. At about the same time, Kogas and fellow South Korean entity SK Group announced another three potential deals in US natural gas business. As Korea seeks to move away from coal and nuclear, its interest in US LNG will increase with time. In another important development, the first floating terminal proposed to export natural gas out of the Gulf of Mexico has been cleared by US regulators. The 13mn mt/yr Delfin LNG project gained clearance early June to export to non-FTA countries. If built, the facility will be positioned 50 miles offshore and could be expanded to 21mn mt/yr. So far DoE has cleared non-FTA LNG exports totaling 220bn m³/yr. 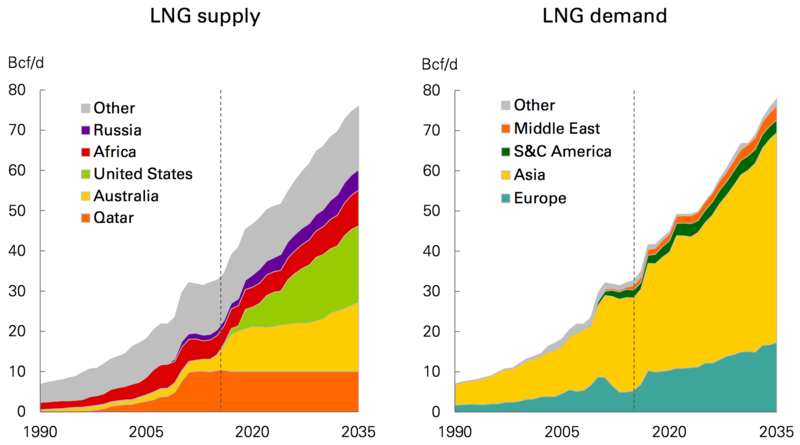 Qatar by contrast is planning to produce 100mn mt/yr of LNG, or 134bn m³/yr, by 2025. This US boost appears to have the full support of Trump. He is engineering a sharp shift in US energy policy by using natural gas exports as an instrument of trade policy, championing sales to China and other parts of Asia in an effort to create jobs and reduce US trade deficits. He described how exports of natural gas, LNG, oil and coal can help strengthen US’ influence globally, bolster international alliances, and help stabilise global markets. But unleashing large quantities of cheap US LNG on the rest of the world could have a dramatic impact on re-shaping markets and keeping prices low. In parallel to this, Senator Ted Cruz announced June 26 that he has proposed a ‘Natural Gas Export Expansion Act’. He said that the act will eliminate the current arduous process that discourages LNG trade, according to a statement from the office of Senator Cruz, and increase LNG exports by facilitating permits to non-FTA countries. The pressure is on Congress to deregulate gas exports, enabling US companies to get on with building LNG export facilities, despite criticism by environmentalists. The Qatar crisis is strengthening calls to do so. Once in place, these developments will open up opportunities in countries such as China and India where strong growth in LNG imports is forecast as they strive to achieve their Paris climate agreement goals and clean air. In fact Trump has just confirmed that a long-term deal may be signed with India soon. The list will also include South Korea, which has a 2012 20-year LNG agreement with Cheniere to import 3.5mn mt/yr. As US LNG exports indexed to Henry Hub ramp-up, the old models of stable long-term contracts are coming under pressure and are having to change in response to what is becoming a more flexible, transparent and liquid market. They will also help increase connectivity between markets and smooth out price disparities. Significant new supplies from the US also reduce the market power of incumbents and increase that of the US. US LNG will, though, face stiff completion from Qatar, which has just announced plans to boost LNG production by 30% as part of its plans to defend its market position. It said that it will raise this to 100 mn mt/yr within the next five to seven years. This is equivalent to a third of current global supplies. These plans are supported by US major ExxonMobil and European majors Shell and Total, Qatar’s existing partners, strengthening its hand in the light of its dispute with its neighbours. This means not only that the LNG market will not come back into balance after 2021 to 2022, as many predicted; but substantial quantities of new LNG will be added at very competitive prices keeping prices low for longer. Qatar’s production costs are low and infrastructure is already in place. But a word of caution. BP’s Review showed that globally the natural gas market was relatively muted in 2016, with gas prices low. Moreover, gas is not replacing coal and renewables are rising faster than any other energy source. A number of recent forecasts, such as by Statoil and Bloomberg’s BNEF, show gas demand to be slowing down from the late 2020s and early 2030s onwards. These potential developments could lead to increasing pressure on gas with time, keeping prices low. BP’s Energy Outlook 2017 is more bullish on gas, but it still warns that only a small part of technically recoverable resources will be consumed by 2050, with long-term impact on price. Clearly global energy supply and demand are undergoing permanent structural change, with renewables gaining ground and fossil fuels retreating in the longer-term. In such an environment, mostly cheaper resources will be able to be developed and compete, mainly in the Middle East, US and Russia. As BP’s chief economist Spencer Dale said when launching the Review: “Low-cost producers will use their competitive advantage to increase their share relative to higher-cost producers.” This may provide US LNG with longer-term opportunities to re-shape the world of LNG trading.